According to one theory, "Satavahana" is a Prakrit form of the Sanskrit Sapta-Vahana ("driven by seven"; in Hindu mythology, the chariot of the sun god is drawn by seven horses). This would indicate that the Satavahanas originally claimed descent from the legendary solar dynasty, as was common in ancient India. Another theory connects their name to the earlier Satiyaputa dynasty. Yet another theory derives their name from the Munda words Sadam ("horse") and Harpan ("son"), implying "son of the performer of a horse sacrifice"
1-They have been mentioned as Sātavāhanas, Sātakarnīs, Andhras and Andhrabhrityas in the Puranas and Coins. 2-Most of the information about the Satavahana kings is interwoven with myths and the information has been collected by a large number of coins minted in Lead, Silver and an alloy of copper. 4-The coins issued by Satavahanas had Bilingual legends. The name of the Kings was mentioned in Prakrit as well as some south Indian Language. 5-Satavahana Kings promoted Buddhism. Nagarjunkonda and Amaravati l became important Buddhist centers during the Satavahana Era. Simuka is mentioned as the first king in a list of royals in a Satavahana inscription at Nanaghat. According to Jain legends, he adopted Jainism; but, in the last years of his life, he became a tyrant, for which he was deposed and killed. The Puranas state that the first Andhra king ruled for 23 years, and mention his name variously as Sishuka, Sindhuka, Chhismaka, Shipraka etc. These are believed to be corrupted spellings of Simuka, resulting from copying and re-copying of manuscripts. Simuka cannot be dated with certainty based on available evidence. 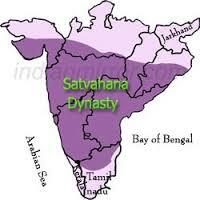 Based on the following theories, the beginning of the Satavahana rule is dated variously from 271 BCE to 30 BCE.